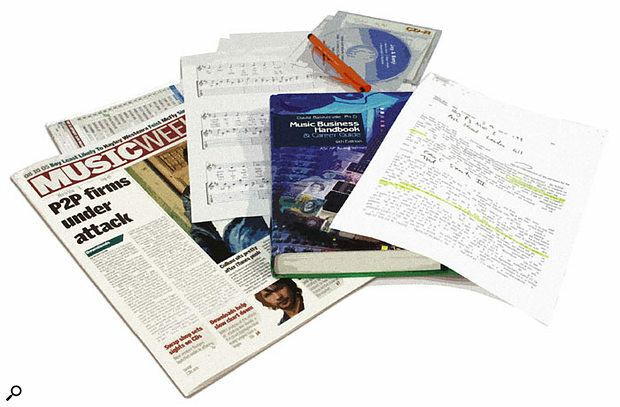 If you want to make money as a songwriter, composer or lyricist, the obvious answer is to find yourself a publisher. But what do music publishers actually do for their clients? Why do you need one, and how can you find the right one? As a music publisher, I'm always answering questions about my business. I would say that the most common one is "What exactly does a music publisher do?" The simple answer would be that I work with songwriters, who compose music and/or lyrics, just as a book publisher would work with an author. Many individuals in the music business, unless they're directly involved in music publishing, have a poor understanding of the particulars of publishing. Couple that with the fact that the laws and procedures vary from country to country and it often becomes quite a daunting task to get a solid understanding of the field. However, in this article, I will attempt to bring some clarity to the complexities of music publishing. Songwriters can use this guide to learn about the basics, from both a US and UK perspective when possible — the laws, registration procedures, collection guidelines and licensing issues differ between the two countries. Whether you're based in the US or the UK, there are plenty of options open when you decide that you are ready to work with a publisher. Before you start to look for a publisher to work with, you should first understand the three basic types of publishers. The first is described as an administrator. Usually an individual or small company, they provide a service, for a small commission, to the songwriter by handling all aspects of the registration, licensing and collection processes which I'll outline later. However, they do not normally pay advances (which I'll also discuss later in the article) and usually do not offer any creative services. The next level of publishers are called 'independents', a category which includes my company, Reach Global. An independent offers the same administration services as an administrator, but also provides creative services and offers competitive advances to songwriters. Their client lists would usually be made up of mid-level artists plus talented songwriters and producers. Most big stars like Jay Z and Eminem align themselves with the third type of publisher, called a major. Major publishers like Universal, Warner Chappell, Sony, BMG and EMI pay millions of dollars in advances to the songwriters and artists in order to maintain their market share. Advance/Recouping: This is the financial arrangement within the agreement where the publisher advances money to the songwriter, before the publisher has collected any income. This concept is often used to satisfy the financial needs of the songwriter, as the entire process of registration, licensing and collection can often take a year or more to come to fruition. The songwriter should understand that if the publisher has paid them an advance, they will not receive any royalties until the publisher makes back their money and turns a profit, often known as 'recouping'. Split: This is defined as the share of income that both the publisher and songwriter will be entitled to. Percentages often range from 90/10 in favour of the songwriter to 50/50, usually common when a company invests a large amount of money upfront to a songwriter as an advance against future royalties. Co-publishing Deal: This is a certain type of publishing deal where the publisher and the songwriter are each 50 percent owners of the copyright. They agree to share the income from the copyright on a 50/50 basis. Administration Deal: Without a share of the copyright, the publisher agrees to service the writer by collecting all sources of income and handling all aspects of administration on a commission basis. The range usually goes between 5 and 25 percent but varies from deal to deal. Term: This defines how long the agreement is actually binding, and could be anywhere from six months to forever. Territory: Refers to the 'territories' or countries where the agreement is binding. It is common to have a worldwide agreement, or sometimes to carve out particular countries, such as when a publisher negotiates an exclusive deal solely for Japan or the United Kingdom. MDC: This stands for the 'minimal delivery commitment'. 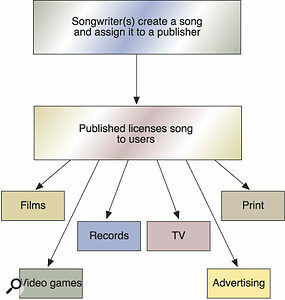 It is the amount of material or songs that a songwriter is required to deliver (for commercial release) during the term of their agreement. The MDC is based on 100 percent ownership of the song. A songwriter who agrees to a MDC of five songs will have to deliver 10 songs if they only write the music and thus get only a 50 percent share of the song. This is a common occurrence since most songwriters specialise in either writing the music or the lyrics, but not both. What does a music publisher do? What kind of royalties do songwriters earn? The general answer I gave above can be fleshed out by saying that a music publisher is responsible for four basic areas of importance to a songwriter. Those areas are song registration, licensing, royalty collection and creative matters. Let's break those areas down. First off, it all begins with paperwork. The registration process can sometimes be a boring and tedious job that only a publisher could enjoy. 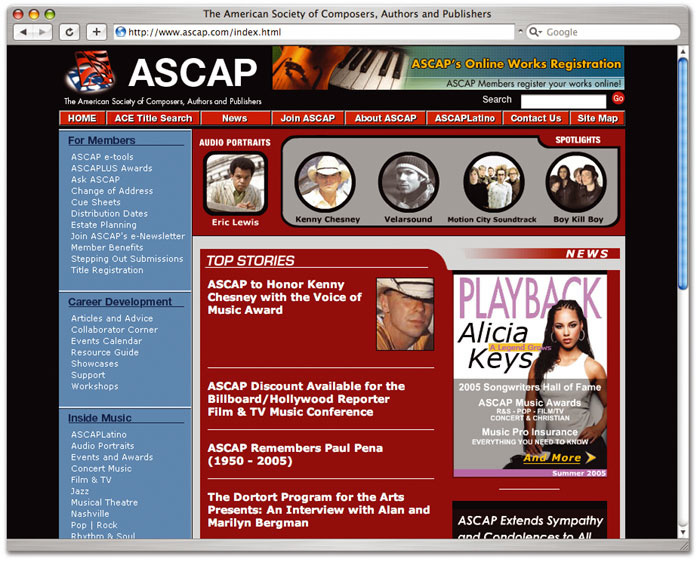 During the initial song registration process, the publisher usually informs ASCAP, BMI or PRS about the new song and relays all the relevant information to them. 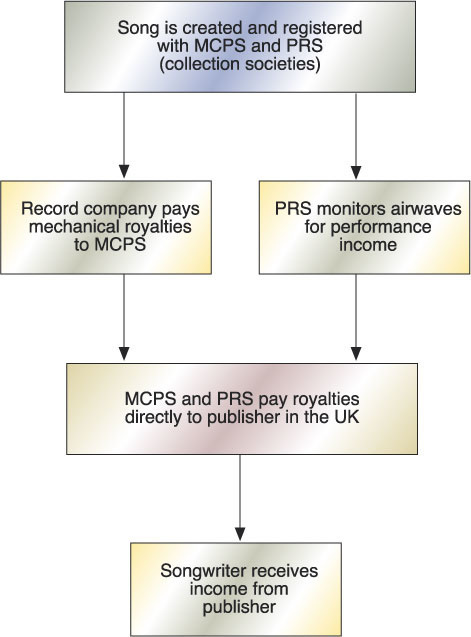 How royalties are collected in the United Kingdom. 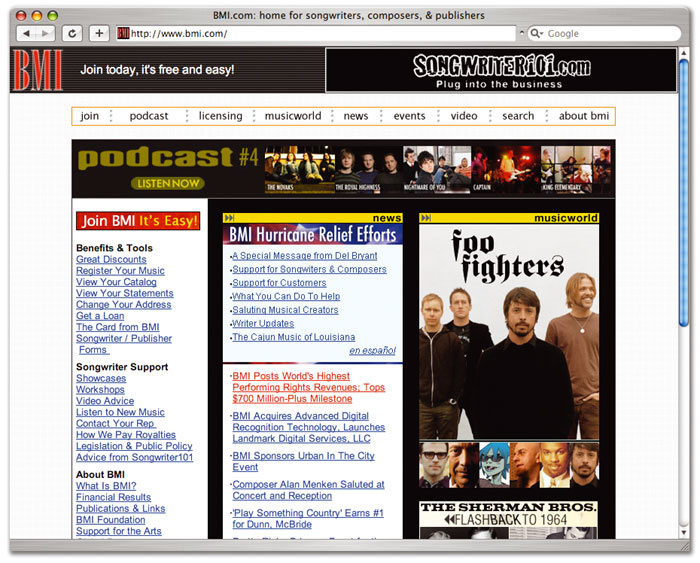 What are ASCAP, BMI and PRS? It is sometimes thought that they are publishers, but they are not: they are 'performing rights societies'. The American Society of Composers, Authors and Publishers (www.ascap.com) and Broadcast Music, Incorporated (www.bmi.com) are American performing rights societies, while the Performing Right Society (www.prs.co.uk) is the equivalent in the United Kingdom. They provide a service by monitoring, collecting and paying out 'performance royalties' to publishers and songwriters. These are royalties that are paid to songwriters and publishers whenever the song is, for example, played on the radio or on TV. Virtually all radio stations and TV networks pay millions of dollars each year to ASCAP, BMI and PRS for what is called a 'blanket licence', which allows them to broadcast any song they wish, as many times as they like. Once the song is registered by a publisher, the performing rights societies will collect and pay out these performance royalties directly to the publisher and songwriter. Songwriters must choose to affiliate and register their work with only one society in the US; a publisher can help you decide which. In the UK, there is only one performing rights society, the PRS. Performing rights societies will pay equal shares of the performance royalties they receive to the songwriter and to the publisher. Assuming the songwriter has a split of more than 50 percent (see 'The Language Of Publishing' box), the publisher will then pass on the appropriate percentage of their share to the songwriter. Those are, of course, not the only type of royalties a songwriter can earn. 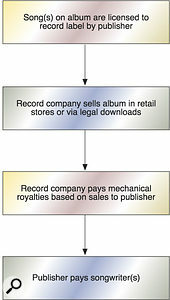 There are royalties that get paid when a song is included on an album that is commercially released in retail stores or made available legally on-line for downloading. These are called 'mechanical royalties'. How does one collect such royalties? That brings us to the second main area of publishing operations: licensing. This is one of the areas where the procedures are different for the United States and the United Kingdom. In the US, before mechanical royalties can be paid out to the publisher by the record label, you first have to license your song to the record label. When the publisher issues a licence to the record label, it allows the song to be included and sold on a particular album. The record company can then pay mechanical royalties according to how many copies of the album are sold. Your rights and payment rates are set down in this licence, so I don't recommend signing a mechanical licence that is directly sent to a songwriter from a record label without the review of a publisher or lawyer. How licensing works in the United States. The procedure is a bit different in the UK. Just as PRS is the Performing Right Society, the UK has a 'mechanical' society called the MCPS (Mechanical Copyright Protection Society, www.mcps.co.uk). The record label which releases the album in the UK does not pay the publisher directly, as they would in the US. Instead, the record label pays the MCPS a certain amount of money, based on sales of the album. 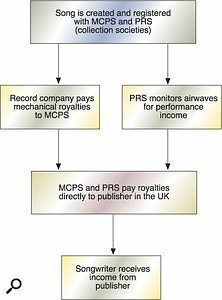 Once the publisher registers the song with the MCPS, they can then collect mechanical income from sales in the UK. There is also an organisation called the Harry Fox Agency which deals with the licensing and collection of mechanical royalties. For a commission, the HFA can collect mechanical royalties via record sales throughout the world. Although some publishers and writers rely on the HFA, it is an optional service as publishers have the ability to collect mechanical royalties without the aid of the HFA. Music publishers also must be knowledgeable about new technology and the licensing of additional revenue streams such as ringtones — songwriters must have a publisher issue a separate licence for ringtone use, and the popularity of ringtones among teenagers leads me to believe that this source of income is not a passing fad but will only get bigger in the years to come. In the US, the publisher will issue a licence to a phone carrier (Verizon Wireless, Nextel or Sprint for example) or a ringtone provider such as Blingtones or Zingy. The publisher would then receive the income directly from the ringtone provider. In the United Kingdom, the income is collected by the collection society rather than directly from the source, just as with mechanical royalties. Generally the income on a ringtone is about 10 cents (for 100 percent of the copyright) in both the US and the UK. With the worldwide explosion of DVD, songwriters should also be aware that a separate licence is needed for collecting the royalties generated by this popular format. The royalty is usually about 12 cents (for 100 percent of the copyright), though an advance payment fee is also sometimes available through negotiation. The income structure is about the same for both the US and the United Kingdom, though you need to keep in mind that in the US, the royalties can be collected directly from the manufacturer, while the royalties in the UK have to be collected by the society. 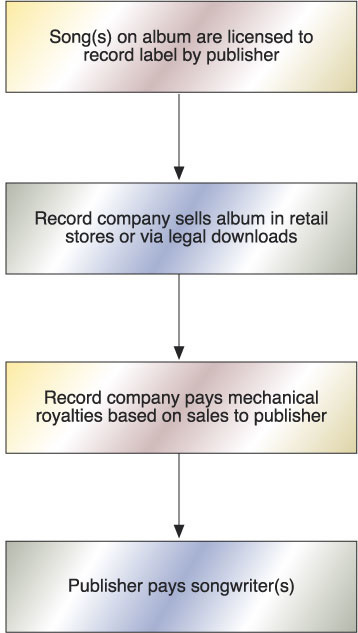 How mechanical royalties are collected in the US. So, through registration and licensing, we've come to the third part of the publisher's role: royalty collection. Song registration and licensing allows the publisher to collect your proper amount of royalties from all sources. We've already discussed performance and mechanical royalties, but there is another royalty type called 'synchronisation' royalties. These usually occur as a one-off negotiated flat fee whenever music is 'synchronised' to a moving picture. By way of example, sync fees are paid if your song is used in a movie, TV show, commercial or video game. An experienced publisher will negotiate the sync fees and issue the requisite licences. (Future residual royalties are further paid by the performing rights societies for many sync rights.) A music publisher works diligently to collect all of these income streams from the various sources. Lastly, there is the fourth element: creative exploitation of the song. Publishers can often spend a large part of their time attempting to 'pitch' the song to advertising agencies, music supervisors who work in film and TV and video game producers. The creative energies of a publisher can bring untold new opportunities to songwriters both artistically and financially. As a songwriter, how do you decide whether you need a publisher or not? I always tell my clients that if they are doing more work on the administration of their songs than on the creative process, then it might be time to relinquish some control of their catalogue to a publisher. If you are equally as talented with business and the creative arts, you might find it challenging to try and work your own catalogue. However, the administrative processes that I have outlined above will quickly hamper the creative process without a firm grasp of the issues, especially if your songs are played and sold all over the world. For example, if you have a big hit in Japan, can you speak Japanese and make sure you're getting all the money you deserve? I bet not. If you compare the issue to other business concepts like taking on a manager or finding a lawyer to work with, you will probably lean towards working with a publisher. And why not — you should be more focused on the creative process than anything else. The act of actually picking out a publisher to work with should be aided by consultation with an experienced music professional like a manager or music-business lawyer. You shouldn't be afraid to ask questions of your peers: Are you happy with their service? Do they pay royalties on time? What have they done for you in terms of creative exploitation? In addition, you should research the company you are attempting to link up with. Do they have four other songwriters just like you? Are you going to be a forgotten face or a small fish in a big pond? Ask yourself what exactly you're looking for in signing with a publisher. Some songwriters always work alone; others form duos or teams, and it's not uncommon to find half a dozen writers credited on one song. Whether you have a publishing deal or not, there remains a certain amount of responsibility that lies with you, the songwriter. A publisher cannot protect your rights if you erroneously give them away. When you're collaborating with another person or persons, there will hopefully be a wonderful creative vibe throughout the process, but don't neglect to address the business element once the song is complete. Don't be afraid to suggest the shares that you think are appropriate for your contribution to the song. When possible, put in writing the songwriters and their appropriate shares, and have it signed by everyone who participated. This could be done on a simple, handwritten piece of paper if need be; it is better than nothing. That will often avoid problems in licensing and registration, which will certainly affect how and when you get paid. Traditionally, there are common share percentages for certain aspects of songwriting. The writer who composes the music is usually entitled to 50 percent and the writer who delivers the lyrics receives the other 50 percent. In addition, it is also quite common to share equally the percentages, based on the number of songwriters, regardless of their individual contributions. For example, four songwriters on a song would each get 25 percent of the copyright. However, in today's urban and pop music landscape it's common to have at least four to six writers on the song, not counting any samples that might exist in the song. In that case, someone like a manager or publisher should take control of the process by getting parties to all agree on their respective shares. That's all very well if you have a track record as a songwriter and can choose to sign with any of a number of publishers. But what if you're not at that stage yet? How should an unknown songwriter go about finding a publisher and getting his or her songs sold? I recommend that as a songwriter, you take as much interest in your career as possible. That means joining societies like NARAS (National Academy of Arts & Sciences — the Grammy people, www.grammy.com) in the US or their equivalents. In addition, attending performance rights society functions hosted by ASCAP, BMI or PRS are a wonderful way to network and expand your relationships. All three of them regularly host songwriter workshops and seminars to assist their members. In the US, songwriters can choose to sign up with one of two major performing rights societies, ASCAP and BMI. As a publisher, I get a large amount of unsolicited material into my office. Even if I do not think the material is right for our company, I listen to everything that comes my way. Songwriters often complain that they do not think the material they send gets heard. I can say from personal experience that it is just not true. Most good publishers are always on the look out for the 'next big thing' and we don't know where it's going to come from. As such, we check everything. As a songwriter, though, there are things you can do to get on the radar of a publisher and things you can do to turn them off to you. When sending out demos, don't worry too much about packaging and graphics, or for the most part, sonic clarity. I don't suggest sending out a very poorly recorded demo that you did on your grandmother's old cassette player, but professional publishers can hear a good song even if it is not mixed properly or contains sounds that are a bit dated. Your concentration should be on the creation of the best material possible, with clear contact information listed on the product, so the publisher can contact you. Professional-sounding phone calls are always acceptable, though in my opinion, most songwriters find it hard to play the line between professionalism and eagerness to be signed. Just like with dating, professional publishers can smell desperation. If you leave 100 phone messages without any of them being returned, it might be a sign that the publisher doesn't think your music is right for them. Publishers spend a large part of their day speaking professionally to other publishers, record labels, managers, lawyers and so on. What's my point? They aren't afraid to talk on the phone. If they want something from you, they'll be in touch with you so you both can start a business relationship. Another fact that most songwriters fail to understand is that this is a business: this isn't a 'game' or a 'hustle'. It's not personal, either. The quicker you, as a songwriter, have that sink into your head, the better off you'll be. So what if a certain publisher doesn't think your songs are ready for a star to record? There are tons of other publishers and you have to stay positive. Remember that each type of publisher has its pros and cons. What's perfect for one songwriter isn't so for another. Choose the one that fits you best. The important thing is that you should know as much as possible about your career. If that means reading articles like this over and over, so be it. If that means asking questions among your peers, do it! What's the bottom line when it comes to publishing? Just be creative — the right music publisher can handle the rest! Scott Rubin is co-founder and Vice President of Reach Global, Inc., an independent music publishing company based in New York and South Florida. An important part of the job of a publisher is to protect songwriters' rights. The most common way to do this is by formally registering your songs for copyright protection. In the US, this is done via the US Copyright Office. In the UK, copyright exists automatically in any written or recorded work, but registering a song with the MCPS is a good way of establishing your claim to have written it in case of dispute — better than sending it to yourself in a Jiffy bag, anyway! As a benefit to the songwriter, a publisher often will play the role of 'bad guy' when working with another party to make sure the songwriters' rights are properly established and granted. In the United States, one of the larger issues in terms of protection comes into play when a publisher attempts to license a song to a record label. Since the record label is the entity paying out the mechanical royalties, they can attempt to pay less than the amount they are required in accordance with US copyright law. (According to copyright law, the current royalty rate you are entitled to receive — called the 'statutory mechanical rate' — is currently 8.5 cents if you wrote 100 percent of the song.) They accomplish this not by breaking the law, but by having you sign documentation that allows the record company to pay you a lower royalty rate or pay royalties on fewer albums. By asking songwriters to accept less money than they are potentially entitled to receive, record companies save millions of dollars in mechanical royalty payments each year. If you work with a publisher, they are experienced enough to not allow the record companies to issue the royalties at a reduced rate, unless the label is actually entitled to according to a prior written agreement (known in industry parlance as a 'controlled composition' clause). The concept of 'statutory mechanical rate' does not apply to the United Kingdom, where rights are a bit easier to manage and protect. However, a UK publisher must still register the song correctly with the mechanical and performance societies to ensure proper and timely payment. Songwriters also need to take care to protect themselves when they sign a publishing deal, often by simply using common sense. Remember the old saying and be careful what you sign. Always have someone with more knowledge than you in publishing, such as a lawyer, look out for your interests. They will guide you to the proper publisher who will protect your rights.